With the vast numbers of Gospel artists making their strides across the recording landscape the past dozen years, it's too easy to let memories of some of the great ones to fade away. It's even more easy to let that happen when you consider that audio of the glorious Golden Age of Gospel is astoundingly hard to come by. With that in mind, GOSPELflava.com is honored to pay tribute to some of the many who fired up the churches with Gospel music in the mid twentieth century. 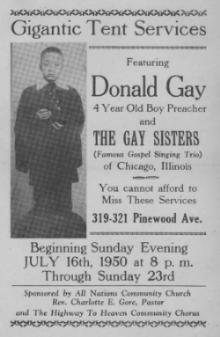 The Famous Gay Sisters of Chicago, along with their younger brother, Preacher Donald Gay (read interview), are in that number. Take in this feature from one who would know: Gregory Gay Jr., the nephew of The Famous Gay Sisters. And don't forget to check out the long-play audio clips available at the bottom of this page (hear audio). The church and Gospel music have long played an integral part in the lives of Fannie and Jerry Gay's children. Eight children were born to this union. While three were stillborn, the remaining five were endowed with a gift of music. Their parents knew early on that these children were indeed unique. Evelyn began piano lessons at an early age. While Evelyn studied intently, a young Geraldine would sit at the piano and pick out by ear and play effortlessly the music that Evelyn had just finished studying. Oldest brother Robert, a flautist, would go on to become a great jazz instrumentalist, sharing the stage with the likes of Dizzy Gillespie and others. Donald, the youngest of them (and affectionately called Preacher Gay) began preaching at the age of three years old, and was the first African American to be featured on the Joe Kelly Quiz Kids Show as a child. Their humble beginnings originated on Chicago's west side, where Jerry and Fannie moved after leaving Georgia for the amenities of a better life found in the north. Evelyn, Mildred and Geraldine began singing as children. They soon formed a Gospel trio, aptly named The Gay Sisters. Evelyn was the composer/arranger while Geraldine was known for her avant-garde style of playing and Mildred captivated audiences with her high soprano voice. They were prominently featured on the live radio broadcast from Pastor Lucy Smith's All Nations Pentecostal Church every Sunday night. Pastor Smith, grandmother of the famed Roberta Martin Singers pianist Little Lucy Smith, was a Gospel trailblazer, preacher and church builder in her own right, with one of the first radio broadcasts to go across the nation. Mother Gay and her children later united with the Church of God in Christ, under the late Elder P.R. 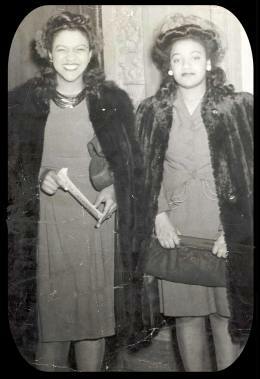 Favors, where she took on the role of choir director and Evelyn and Geraldine served as accompanists. Mother Gay was a praying woman with deep faith and strong conviction. She instilled the principles of holy living within each of her children and told them that if they served the Lord, "their gift would make room for them and bring them before great men". They would soon realize the power of that prophetic word. 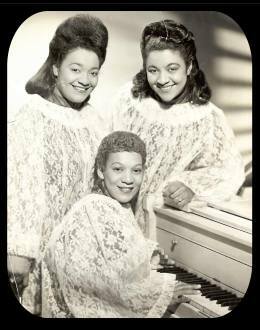 In 1946, the sisters went to New York and cut their first record, "Just a Little Talk with Jesus" and "The Old Rugged Cross" on the Dauphin record label. They continued to perform and soon caught the attention of Herman Lubinsky, President of Savoy Records, and were signed to the label in 1950. Their Savoy sessions produced such Gospel classics as "Little Wooden Church on a Hill", "God Shall Wipe All Tears Away" and "I'm A Soldier In The Army of The Lord" (which is sung in devotional services regularly on Sunday mornings) and "We're Gonna Have A Time". However, it was their recording of "God Will Take Care of You" that captured the hearts and minds of the country, catapulting them to nation wide acclaim. The album went on to sell over 75,000 copies. At the invitation of Mahalia Jackson (whom Evelyn had accompanied earlier in her career), Preacher Gay and the Gay Sisters appeared at Carnegie Hall in 1952. 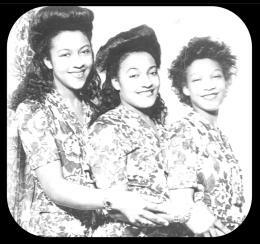 Preacher Gay and the Gay Sisters became the ambassadors of Gospel music, representing the Church of God in Christ. Their many travels took them across America to churches, auditoriums, theatres and universities including New York’s Apollo Theater, The Kiel Auditorium, The Astrodome in Houston, Texas and the Bicentennial Celebration of the United States at the Washington Mall. They appeared on national and local television and radio, and joined such major music personalities in performances and recordings as Dr. Thomas A. Dorsey, Clara Ward, Sam Cooke, Elvis Presley, Pops Staples, Andrae Crouch, Mattie Moss Clark, Alex Bradford and many others. Such well-known artists as Bishop Carlton Pearson, Aretha Franklin, Candi Staton, Pop Winans and Lyle Lovett have covered their music. The family was honored by the Smithsonian Institute for their contributions to the advancement of Gospel music in America. With over fifty years of carrying the Gospel message via the medium of music, and although Robert, Father Jerry, Evelyn, Mother Gay and most recently Mildred (in 2002) have gone on from labor to reward, the legacy and music still continues on. Donald serves as pastor of the Prayer Center Church of God in Christ, the church founded by Mother Fannie some 40 years ago on Chicago’s southside. Dubbed the Errol Garner of Gospel music, Geraldine continues to mystify both young and old alike as the church musician. They continue to perform with the addition of their children and grandchildren, telling the world "Be not dismayed, whatever betide, God Will Take Care of You." There are song snippets available from the album. If you don't have RealAudio, be sure to obtain your free RealAudio player software first, by clicking on the blue RealAudio icon on the right. "God Shall Wipe Away All Tears"
"God Will Take Care Of You"
All content in GospelFlava © copyright 1997 - 2005. No information to be reprinted or re-broadcast from this site without the expressed written consent of GospelFlava.com. All rights reserved.